SlideShare, the “YouTube for presentations” has unveiled two premium services for businesses— LeadShare and AdShare. SlideShare lets anyone share presentations and also serves as a social discovery platform for users to find relevant content and connect with other members who share similar interests. 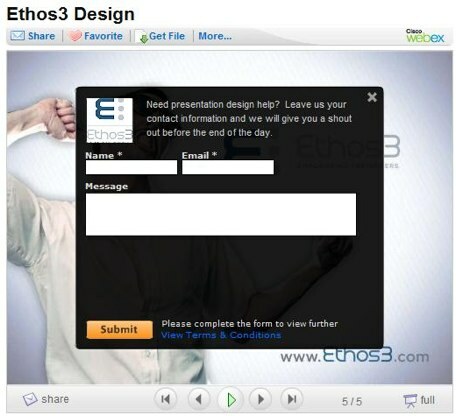 LeadShare is a self-service tool that businesses can use to capturing leads from documents and presentations. To capture leads, companies currently have to work with third-party vendors to set-up complex and sometimes costly lead generation campaigns. And traditional lead gen services require end users to first complete lead information before downloading a whitepaper. LeadShare’s process takes a different twist by asking businesses to share content and then letting users choose if and when to get in touch. SlideShare’s CEO Rashmi Sinha says that the quality of leads is actually better because users who input their info are genuinely interested in the service or product. LeadShare lets businesses setup a simple campaign in minutes and control exactly how they capture leads and the depth of information they want to capture. For example, you can ask for email addresses, names and phone numbers or capture information that is customized to your presentation or service. Leads cost between $1 to $22 for the business depending on the how in-depth the questions are. So if you only want to capture email addresses, SlideShare will charge $1 per email address. But if you want to capture a more detailed question such as geographic locations, this will cost a business more money. 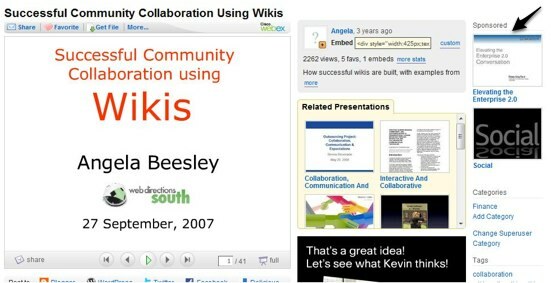 You can capture leads on SlideShare.net, on your own site and anywhere the content gets embedded. Leads are captured in a dashboard that SlideShare creates for each LeadShare campaign. The second service for businesses, AdShare, lets users promote their content on SlideShare’s platform. SlideShare will place a “sponsored content” box next to presentation and documents that are contextually relevant. The platform will charge businesses $0.25 per click. If content is clicked more often, it gets promoted more and vice versa. Similar to LeadShare, AdShare is a self-service product that businesses can manage on their own. And of course, the two services are complementary to each other—you can use AdShare to get more views and potentially capture more leads. This is SlideShare’s first play at premium services, and both seem compelling to businesses who are looking not only create leads but to find a cost-effective way to market presentations and documents while harnessing social media. According to Quantcast, SlideShare gets over 20 million visits per month and is steadily growing. Currently, the platform only makes money through advertising on the site. Sinha says that the new features are aimed towards the business community; enabling both small businesses and individuals get the message out about their products, services and content on a social media platform. Competitors Scribd and Docstoc both make revenue from content selling models. Docstoc also lets content owners share revenue from Google AdSense advertising alongside the document. Over the past year, SlideShare has unveiled a mobile-friendly site, launched a free Microsoft PowerPoint 2007 plug-in that allows for one-click publication of your presentations to the cloud, and support for embedding YouTube videos in SlideShare-hosted presentations.